Mary, who moved to London in 2008 and became a student nurse in 2010, has not only achieved a first class honours, but was also awarded the prestigious Gordon Parratt bursary award by the Harold Wood League of Friends. During her course, Mary undertook a range of placements where she gained essential experience of working on medical wards, trauma, neuro ITU as well as elderly care. Her final placement was undertaken on Mandarin A now Gentian Ward at King George Hospital in Goodmayes, where Mary managed to secure a permanent post, starting just one day after completing her course. Mary started working as a grade 2, but has since received her pin - registration from the Nursing and Midwifery Council. "I really enjoyed my time at LSBU," Mary reflects on her time as a student at the University. "The staff at Havering were very supportive and the support I got from my fellow students was also excellent. I have made many good friends." 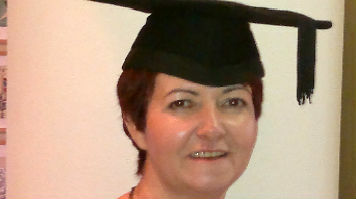 Mary was based at LSBU's Havering campus, which specialises in delivering Health and Social Care courses. Mary received her first class honours degree in BSc (Hons) Adult Nursing at LSBU's Health and Social Care graduation ceremony on Monday 28 October, which went ahead as planned despite the exceptionally stormy conditions. The ceremony took place in the heritage-listed Royal Festival Hall, one of the world's elite event venues, situated in the Southbank Centre near LSBU's London campus.